Have you had an accident at work as a refuse collector? The demanding nature of the refuse collectors job and the adverse working conditions are just two of many factors that put refuse collectors at high risk of injury. Some studies indicate that the injury rate in this particular industry is as much as 4 times more than most other industries. If you work as a refuse collector and you suffer from a work-related disease or injury, you may be eligible to claim compensation. What Makes The Refuse Collection Industry High-Risk? 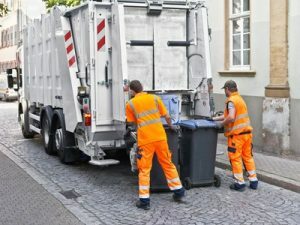 Although every industry has its own inherent risks – even office workers are at risk of repetitive stress injuries among others – those employed in the refuse collection industry are exposed to several different conditions that put them at high risk for injuries and other medical conditions. This is one of the most common injuries in the refuse collection industry. Glass shards, jagged metal, and other sharp objects that are carelessly thrown into a bin or bin bag can result in lacerations and cuts. Loosely discarded syringes, sewing needles, pins and other similar pointed objects can result in needlestick injury claims. With needlestick injuries, in addition to the physical injuries inflicted, there is also the fear of getting infected by a contaminated needle or syringe. Although refuse collectors no longer manually lift and hoist large rubbish bags into the bin lorry as much as they used to, they still have to get large and heavy waste bins and rubbish bags from the street to the bin lorry. They do this many times during any one shift, which puts them at risk for different types of strain injuries and manual handling accidents. Waste collection vehicles undergo a lot of wear and tear, especially in regards to the mechanical hoist that is used to load and unload bins. Depending on the type of mechanical failure, a refuse worker could get injured if a bin falls on them or in a worst-case scenario, they may get entangled in the mechanism while loading or unloading a bin. Head injuries, crush injuries, and concussion are the most common injuries resulting from mechanical failure. Refuse collectors work in all types of weather conditions. During the course of their work day, they obviously walk on roads and pavements. Broken pavement tiles, potholes, unsalted icy surfaces in winter, and slippery road conditions increase the risk of injuries caused by trips, slips and falls. The nature of the job is such that refuse collectors cross roads multiple times as they pick up and drop off bins or refuse sacks from homes on the other side of the road from where their vehicle is. This increases the risk of being struck by moving vehicles. Who Is Responsible For A Refuse Collector’s Safety? As in any other industry or workplace, employers in the refuse collection industry too have a legal duty of care towards their workers. This means they are required by law to do a risk analysis and accordingly put measures in place to protect their workers from potential harm as they go about their work. Education on the risks involved and how to protect themselves from these risks. An employer may be held liable if they failed to meet any of the legal requirements of care and a worker was injured as a result. The first thing to do after any type of accident as a refuse collector is to seek medical help and get your injuries treated. Do this regardless of how severe the injuries seem at the time of the accident. A medical check up will not only serve to get the necessary timely treatment for your injuries but will also serve as evidence should you decide to pursue a refuse collector accident claim. The next thing to do is to get in touch with an experienced personal injury solicitor to get advice on your legal rights and your options regarding claiming compensation. Our personal injury solicitors go out of their way to help accident victims pursue their legal rights without having to worry about upfront legal fees or consultation fees. Most personal injury solicitors will offer you a no-obligation first consultation so they can first gather all information about the accident. If they determine that you have a strong case that warrants pursuing a refuse collector injury claim, they will advise you to go ahead and will also fund the legal process using a No Win No Fee agreement. The exact terms and conditions of a No Win No Fee agreement may differ from one solicitor to another, but in general this agreement states that you do not have to pay the solicitor any upfront fees. If your accident claim is successful and you are awarded compensation, you will pay the solicitor a percentage of the awarded amount. The No Win No Fee agreement will lay out the specifics of your solicitor’s responsibilities as well as how their fee will be settled if the claim is won. The court will take a number of factors into consideration when calculating how much compensation you could claim. You can expect to recover all your medical expenses, from the treatment itself to all treatment-related expenses. You will also be compensated for your pain and suffering, loss of income, and the cost of structural changes to your home or vehicle that are necessary to accommodate your injuries where applicable. You may also be awarded the potential cost of long-term treatment or rehabilitation if a medical expert testifies that you need it. If you suffer an accident at work and intend pursuing a refuse collector accident claim, you must file this claim before the 3-year deadline.